Hand operated hydraulic crimping tool with set ring dies is designed to crimp Copper / Aluminium Cable terminal ends upto 400 mm sq. The crimping tool with set of ring dies is designed to crimp copper / aluminium cable terminal ends upto 400 mm sq. 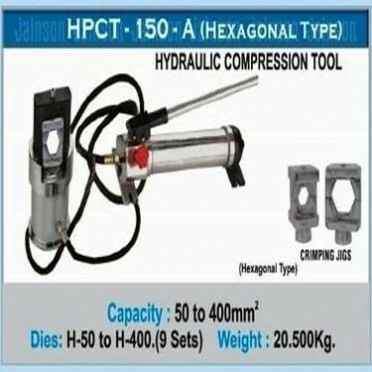 The crimping jack and hydraulic pump are connected with a 2 meter length hose pipe and the hydraulic pump are connected with a 2 meter length hose pipe and the hydraulic pump are connected with a 2 meter length hose pipe and the hydraulic pump is having a capacity to develop pressure upto 250 kg./ cm sq. The crimping jack is made from solid special alloy steel to withstand the pressure developed while crimping and safety .